Here’s a note I finally got around to emailing. Since I’ve received tremendous support from many people I “met” through blogging, I though it would be appropriate to post it here, too. Thank you! This is a bit late, but I wanted to thank you for your role in helping me land a new position, since it truly takes a village to find a job as well as raise a child. I’m doing this bcc since I have many people to thank. If you’re on this email, you’ve offered me a job lead, a networking interview, a reference, some good advice, or perhaps just a kind word of encouragement, all of which is greatly appreciated! I’m thrilled to announce that I started a position last month as a Program Officer for the Eisenhower Fellowships. Although this is perhaps not the job I tailored my resume for, it turns out that I found a perfect fit for someone with my eclectic background and range of interests. Bonus: it’s even related to that master’s degree in international relations I earned eons ago. I’m not sure where else I’d find a job that requires me to research Thai television spectrum auctions, follow the status of Muslim insurrections in the Philippines, figure out the best place to stay in Research Triangle, NC without a car, and track down a variety of film producers, venture capitalists, policy wonks, and imams in various US cities. That’s all in a day’s work, as I develop the program for each of my international fellows before they arrive to crisscross the country for a frenetic seven weeks. The job is guidance counselor, travel agent, and geek, all rolled into one. For now, this is a contract position until early December, but it’s definitely been an experience already. I found this job through networking, and would not have landed here without countless hours of job leads, advice, and encouragement from you and others in my network. If I can ever be of assistance to you, in a job search or otherwise, please let me know. Breaking News…I Have a Job! This came up so quickly, my head is still spinning. I was interviewed on Thursday, offered the job on Friday, and started Monday. It’s been a whirlwind on both the work and home fronts here at the end of day three, but it’s a good problem to have. It’s a four-month contract position replacing someone who is out sick, for a time-sensitive program, thus the urgency in getting me in ASAP. As far as I know, the person is planning to return, however, another of my new colleagues is looking suspiciously pregnant, so perhaps there is hope for work after December! I’ll try to blog more about the details, but one of the lessons learned is that it pays to be persistent and follow organizations you are interested in. I had originally applied for a position here in January, but was not selected for an interview. I managed to network my way to one of my colleagues via LinkedIn. I did not know her, but she graciously agreed to meet me for coffee to tell me about her job. Then, when another position opened up in June I applied and was interviewed, and was apparently their second choice. I thought then that was it, but then they called me with the offer for the replacement position. Twice now I’ve had multiple interviews for a promising position, only to be told in the end that the position was filled by an internal candidate. I find this curious. I thought that the usual process when one intends to hire internally was just a cursory look for external candidates (if at all) to satisfy expectations that internal candidates are reasonably qualified compared to the general labor pool. Has the process changed so that one is required to drag one or more external candidates along for the ride before justifying an internal hire? Is the “we hired internally” explanation a convenient white lie for something else? Or am I just not performing up to snuff in interviews? I’d love to hear – is this happening to other job seekers? My job hunt continues, and it’s a tedious slog — another application to submit, another interview to prepare for, another rejection email. 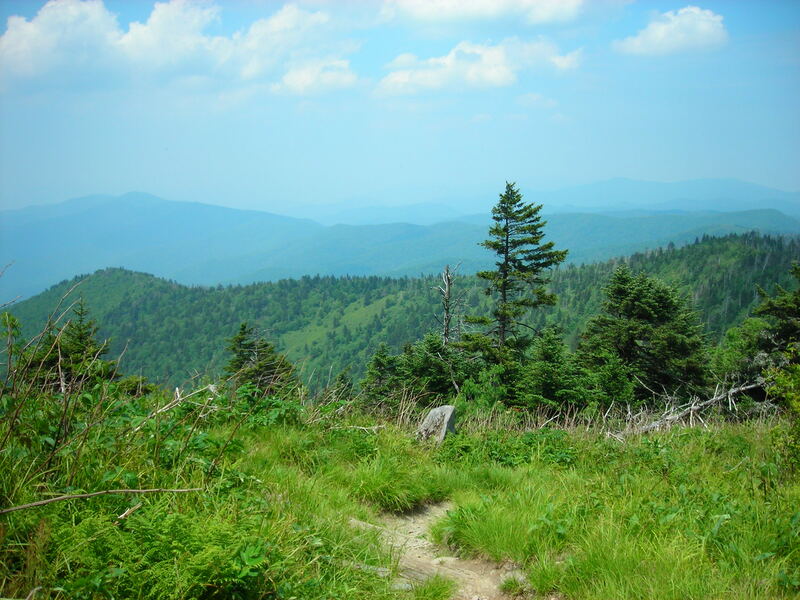 For inspiration I’ve been reading blogs written by people thru-hiking the Appalachian Trail, which can also be a tedious slog, contending with bad weather, equipment issues, and sore feet. It’s still amazing to me that it’s possible to blog without electricity and while transporting all of your belongings by foot. This talk of the outdoors leads me to the silver lining of not having a job: I don’t have a job! As in IT’S SUMMER! The kids are at the perfect age – old enough to be able to do things, and young enough that they still want to hang out with mom. We’re doing a mid-week camping trip to the beach next week (before it gets too stinkin’ hot to sleep in a tent around here), and have more trips planned. 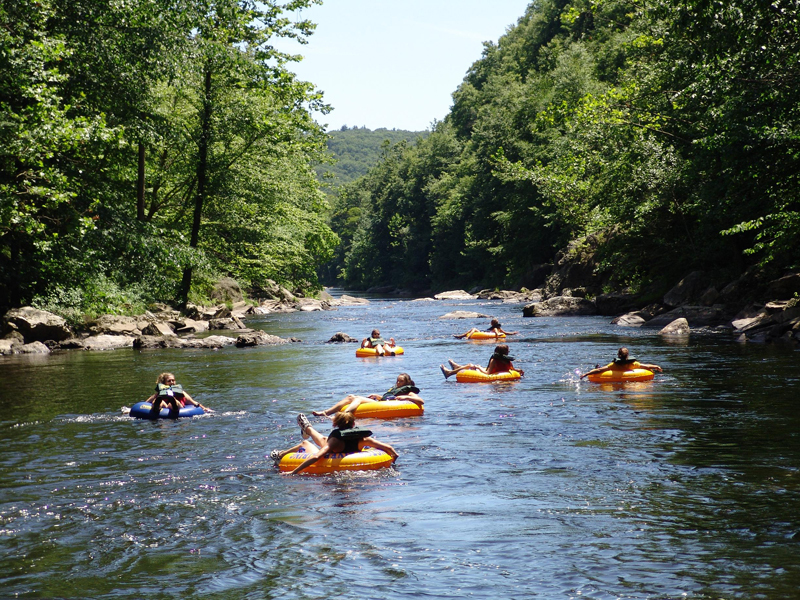 I even ordered some inner tubes so we can spend some time floating down local streams, many of which are at least partially navigable for most of the summer. The husband said something to the effect of “how redneck are you planning to get, anyway?” Maybe I should get a case of Pabst Blue Ribbon for good measure. What I really want are kayaks, but that’s another project entirely. It promises to be a fun summer, as we have plenty of places to go and things to see within an easy drive. Easy on the pocketbook, too, since we don’t mind sleeping in a tent. And yes, I am still looking for a job. Really, I am! No, I’m not talking about what doctors sometimes recommend for a slow-growing cancer, although there are days when the job search feels a lot like that. I’m referring to the fact that it can take a long time for the right opportunity to appear (or reappear, like one of those slow growths). Within the past few weeks, three positions have opened up at three different non-profit organizations that I’ve been interested in and at which I’ve applied in the past. One is a large organization for which I’ve volunteered for a long time. The others were non-profits I became aware of through my job search. First time around, I got no interviews at any of the three. Since then, I’ve done some networking, which has resulted in one interview so far. For the other two, I’m confident my resume will at least be reviewed, since I’ve gotten to know people inside the organization in similar roles and learned more about the skills and experience that are deemed most important. And for good measure, one of those resumes will probably go through the CEO, since I know somebody who knows her. Sometimes you have to pull out the big guns, but it’s important to keep your powder dry for when you really need it, too. The interview I did get might also have had something to do with the fact that I’ve been volunteering with an organization with a similar mission, and recently completed a relevant certificate program, paid for by the organization I’ve been volunteering with. A similar situation occurred with a for-profit role, too. I had been phone screened, but was told I wasn’t a great match since I didn’t have enough experience in a certain area. The interviewer was great –she said she was impressed with my experience in other areas, and gave me good, honest feedback. She recently contacted me, asking if I was still looking, and noted there was another role I might be a good match for. That trail has since gone cold, so perhaps her hiring colleague had other things in mind, but it is still nice to know that someone thinks I’m qualified for something! The moral of the story is to identify organizations you are interested in, and make a point to get to know people there, even if they don’t have an immediate opening, or if you’ve been rejected. Find out what skills they are looking for, and tailor your resume accordingly, or develop them if you don’t have them. If they are a non-profit, consider volunteering for them or a similar organization. And of course don’t burn any bridges. Ever. You never know who might be helpful in the future. This can be a long and difficult process, but it can bear results. I guess that’s why they call it networking. A side note to non-profit HR departments: it’s not good PR to diss your volunteers. The organization where I’ve volunteered for many years rejected me last time with a form email that bordered on rude, telling me that I wasn’t qualified. They should have incorporated questions about volunteer service with them into their employment application, so that volunteers can at least receive a kind rejection that acknowledges their volunteer service even if they are not a good fit for the job. Last time around, I’m not sure a real person even read my resume, since their online app is long and convoluted. That’s part of the reason I enlisted the big guns this time. Enough with the military metaphors for now, although the husband is dragging us to Gettysburg soon, so I’m sure I’ll have an endless supply after that. No, I haven’t fallen off the edge of the planet since the end of the A to Z Challenge. I just decided to take a few days off from blogging to catch up on other things, which turned into a month. On the job front, I’m sorry to report that things are much the same. These include a couple of phone interviews, a number of calls from recruiters, an upcoming interview for a position I have mixed feelings about, but no job to report. It’s still maddening to think that at the drop of a hat, I could be scrambling to reorganize all of our summer activities during a mad search for childcare, or I could still be looking for work in September. Another challenging aspect about this phase of my job search is that I feel like I’ve tapped out many of my obvious networking opportunities. Some people have been extremely helpful, but I don’t feel like I can keep asking them for assistance, especially if I can’t be helpful to them in any way. Companies can be very cautious about hiring, and some seem to really drag the process out. I got a random call a couple of weeks ago regarding a position I’d given up on long ago, asking if I was still available, and assuring me that they were still planning to fill the position and would be reconsidering candidates within a few weeks after a reorganization. I have no idea how many candidates they are trying to string along, but I’m not particularly hopeful that they will actually fill this position, or that this would be a good place to work long-term if I am the candidate they end up choosing. On the brighter side, I am volunteering part-time for two organizations where there’s a chance that my work could morph into a paid position, at least part-time, and I’m developing some new marketable skills. I like this definition, as I’ve always liked spare, elegant writing a la Hemingway. Speaking metaphorically, aren’t most of us zeroable, at least in our professional lives? Most of us (small business owners and some CEOs excepted) are zeroable in the sense that if we quit, were terminated, or dropped dead, the organization would perhaps miss a beat or two, but then go right on functioning. It’s easy to get caught up into thinking we are irreplaceable in our jobs, but that’s rarely the case. 1) Don’t ever take your work situation for granted, as you can be replaced. 2) Have a different place in your life where you are not zeroable. Most people are irreplaceable to their families and close friends. Make sure you cherish these relationships. That’s it for the A to Z Challenge. Now, back to less regular, but hopefully less zeroable posts!